We have talked about Writing Quality Posts to achieve success in Blogging. But even after Producing Quality Content, you may still face the situation wherein your posts get only 20 or 30 Unique Visits. Now a Question would be surfacing in your mind i.e. Why ? Content is the King, still no Success ?? The answer to this is pretty simple. Just producing quality content doesn’t mean your posts reach everyone. To overcome this problem you need to Promote your Posts. Because of such a shortfall in traffic, bloggers get depressed & start to feel that they can’t mould themselves into Successful Bloggers. But a person who is quite passionate about Blogging will never give up. Instead that person would try some changes to Promote his/her blog posts. So today I’m giving out some tips with which you can Effectively Promote your Posts. If you have a Strong Social Media Base – Mainly Twitter & Facebook; then you don’t need to worry about this aspect. If you are a newbie then you need to work hard to build a Strong Social Media Base first. I wouldn’t term it easy, but if you have patience and show some consistency then you can surely build a strong base. Try to setup Automatic posts Submissions using your Blog’s RSS Feeds in any of these 5 Social Media Apps. CommentLuv has become so popular these days. Many blogs have started using it for maybe driving more comments, giving the Commentators their reward in the form of a back link. The second part is what you need to focus on. Comment on such blogs and get a link back. But one thing you need to make sure when commenting on blogs is that you should post a Genuine comment. Don’t just comment for the sake of a back link. If you want to promote your latest post, then the best way is to participate in Link Sharing Events. My friend Nile Flores from Blondish.net hosts the #SharingSundays event every Sunday. During this event one can share his/her blog’s latest post on Nile’s Fan Page. Look at the above image to know how one should make an entry into such events. That’s it! I’ve just mentioned the vital points for promoting your posts. Would you like to add some more points besides the above three ? Do you think Social Media is becoming a very important aspect of Blogging these days ? No doubt social media is a great source for promoting blog post/website. Apart from social media CommentLuv also help lots in promotion. Ya these days Blogs Powered by CommentLuv are quite famous. I will think on adding it to DailyBlogging aswell. I thinks it also depends on your content. I mean, if your posts are handy and a good solution for someones, Google will bring tons of new visitors. However, building a strong community is always a best method to boost your loyal visitors. Ya I agree with you. It’s not a good practice to just comment blindly on CommentLuv blogs. Instead read, gain some knowledge and then post a valuable comment. Someone once told me that the way to success was to hire people to run the business that are smarter than you are. When I think about it that seems to be true in any big business I have ever seen. What do you think. It’s necessary to hire people, only when your Business is big enough & you are unable to handle it alone. Hi Mani, I agree with your three points to promote blog post. At the time, Social media is one of the basic steps to increase the high level. Great article. SMO (Social Media Optimization) is the most vital of the lot. But still you need Quality Content to Promote on Social Media sites. This is indeed a great post for me, Mani. 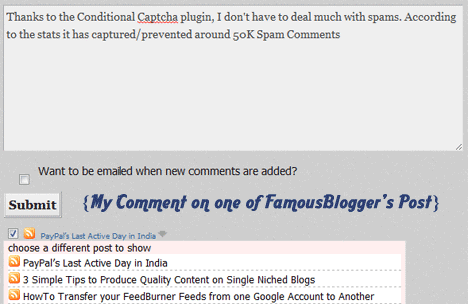 I have commentluv plugin installed on my blog and really been using blog commenting as a way of promoting my blog post. I also run a top commentators contest every month and use a few other strategies. But what I found most challenging is social media. Of course I’ve a fan page for my blog but I’m not really using it to the fullest. I’ll just have to plan out a way to use these your suggestions especially about facebook. Thanks for this one. That’s great to hear. Well to succeed in Social Media you need to spend some time on it. Work on building some nice friends,networks & you’ll see even your blog’s facebook fans increasing. Good ideas on promoting blog posts. Just like what you have said, I like to comment on blogs with CommentLuv enabled. I ironically, I actually came to this post because of number 2…I see commentluv is disabled now, but it was such a great post I had to mention something. Ive been using social media FOREVER, but Ive never heard of link sharing events…so my big bad know-it-all marketing self learned a thing or two! Thanks for the great post!! I’ve always preached “comment marketing,” however, Google is making it more and more difficult to search for these blogs that use the commentluv plugin. Using intitle and inurl tags got me temporarily locked out of Google. Love the theme, by the way. Making a Community or Facebook is the Best and the Effective way to Promote your Post Strongly. Great article!I would also like to add Linkedin and Youtube on the list of great social media websites that you can use for FREE. SEO these days has been revolving around social interaction and will stay this way up until who knows when! I think seeking other experts in their fields, like SEO, internet marketing, video creation and many others can help you tremendously in your blog, that is, only if you have many things to do and can’t handle by yourself. I agree that blog commenting on blogs with commentluv can really help in promoting your posts. Very insightful. Will definitely share this article on my Twitter account. Looking forward to your future posts. No doubt facebook and twitter has become the main base social site’s. I wanna to create health related page on facebook. All of the tips mentioned are true Follow these and you’ll go with your promotion without a hitch. I’m definitely installing commentluv on my blog now! It’s not the first time that I see it highly recommended for improving activity and traffic to websites! Hello do you have a tutorial on how to find a commentluv activated site? what is the footprints for that? You can do a quick Google search with operators to find CommentLuv Blogs. But if you are not well versed with the Search Operators then a site like (dropmylink.com) would help. Good niches and content quality are the big factor in blogging without any power of these two, you won;t survive internet marketing! Good and very informative post. I will come back to your blog regularly. One thing: I do not exactly know what do you mean in the second paragraph. Could you please explain your opinion? I also do agree that blog commenting is another best way to promote your posts and your website as well. I love commenting in a blog that uses “commentluv” because it allows me to leave to 2 links along with my relevant comment. 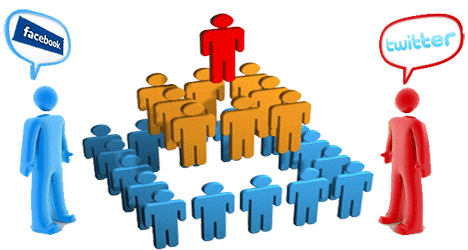 Every blogger wants to add more and more promotion for his posts! Simple tips but it works great.With strong social networks it can do wonders.Thanks Mani bro for sharing. Promoting the blog is the prominent thing every blogger should do for increasing the site traffic. Well i never had luck in the past with twitter but i will give it another try ! As you have said promotion is very important for a blog to succeed. Every blogger must have a strong online social life for that. I agree with your three points to promote blog post. At the time, Social media is one of the basic steps to increase the high level. Great article. Your well reputed social relations works as right hand in case of promoting ideas.So after completing your post send links to well known social sites where you can earn real traffic, comments, profile promotions like facebook like us, tweet us, pin us on pinteres, digg us etc who can play a leading role in your site links. The above ways to promote the posts is very impressive and effective. Thanks. Thank you so much for share the great information…!!!! I am agreed with you commentLUV enable the commenter to post of its blog post with the comment and people are using it to measure the results. Thanks for sharing post you say right only social media is a best techniques to get huge traffic own blog. Just wanted to ask you and your readers if anyone has had recent issues with Facebook! Recently, they removed every single post from my business page and personal page that linked to my website!!! They said it is spam but the articles in the links took me ages to write and are defo not spam! Do you think this us a strategy to make people like me have to pay for ads?? ?